USB keeps disconnecting and reconnecting issue is really annoying especially when you need to use the USB port immediately. Fortunately, there are some available ways to solve this issue quickly. When you connect a USB device with the computer, the USB hub may keeps disconnecting and reconnecting randomly on its own. If all computer USB ports keep disconnecting and reconnecting Windows 10, the first thing you need to do is to make sure whether it can work fine on another computer. If it works well, it is quite possible that there is nothing wrong with the USB device itself. On the other hand, you can also connect another normal working USB drive to the computer to check whether the USB connection is good. If USB disconnects after few seconds again, you should consider hardware or driver issues on Windows 10/8/7 more. Step 1: Press the Windows + X keys simultaneously and then click on the M key to open Device Manager. Step 2: In the Device Manager window, please go to find the Universal Serial Bus controllers option and expand it. Then, you need to look for the listing which is related to your USB driver. If it is a regular USB drive, it will be listed as a USB Massive Storage Device. If USB 3.0 keeps disconnecting Windows 10/8/7, you need to look for USB 3.0 Extensible Host Controller. Here, take the USB 3.0 device as an example. 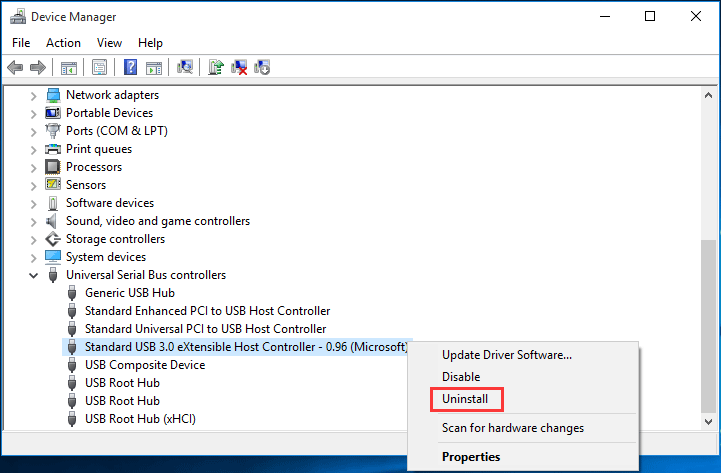 Right-click on the Standard USB 3.0 eXtensible Host Controller option and choose the Uninstall option to uninstall it. When the uninstallation process ends, you need to reboot your computer to allow Windows to reinstall the drivers automatically. Some users say that they solve USB keeps disconnecting and reconnecting issue by turning off the power option. If solution 1 doesn’t work, you can try this way to get rid of the issue. Take the USB 3.0 device as an example. Step 1: You still need to enter the Device Manager interface and find the Universal Serial Bus controllers option. Step 2: Right-click on the Standard USB 3.0 eXtensible Host Controller option and choose Properties from the pop-out list. Then, switch to the Power Management section. Next, uncheck the Allow the computer to turn off this device to save power option and press OK to keep the change. By doing this, it will make sure that the system will not turn off the USB device when you are using the computer but don’t use the USB device for some time. If you are using an external hard drive which keeps disconnecting and reconnecting in Windows 10, you need to use the OEM driver. Perhaps, the driver can work well in the previous version, but it doesn’t work after an update. Then, you will need to reinstall it in the Compatibility Mode. Step 1: Download the latest version of the Universal Serial Bus controllers driver from the manufacturer’s website. Please download the proper driver according to your own situation. Step 2: When the download process finishes, you need to find the setup file on the specified folder, right-click on it and choose Properties from the popup list. Step 3: Switch to the Compatibility tab. Then, check the Run this program in compatibility mode for option and choose an older Windows OS like Windows 7. Please make sure that the driver can work normally under the selected OS. At last, press the Apply and OK buttons successively to save the change. After these three steps, you need to restart the computer to see whether USB keeps disconnecting and reconnecting issue disappears. Some hardware or device issues can also lead to USB devices disconnecting and reconnecting Windows 10/8/7. Then, you can run Hardware and Devices Troubleshooter to fix the hardware or device issue. Step 1: Type Troubleshooting into the Search bar on the desktop and then press the Enter key. After that, choose the first option from the search result. Step 2: You will enter Troubleshoot computer problems interface directly. Next, choose the Configure a device option under Hardware and Sound. Step 3: You will enter the Troubleshooter interface. Then, check the Apply repairs automatically option or not according to your own requirement. Next, click on the Next button to continue. Step 4: Troubleshooter will begin to scan and fix the problems. If you check the Apply repairs automatically option, it will fix the found issues by itself. If not, you will see a scan report. Then, you need to choose the ones you want to fix and click on the Next button to fix the issues. At last, you need to reboot the computer and check whether USB disconnects after few seconds. 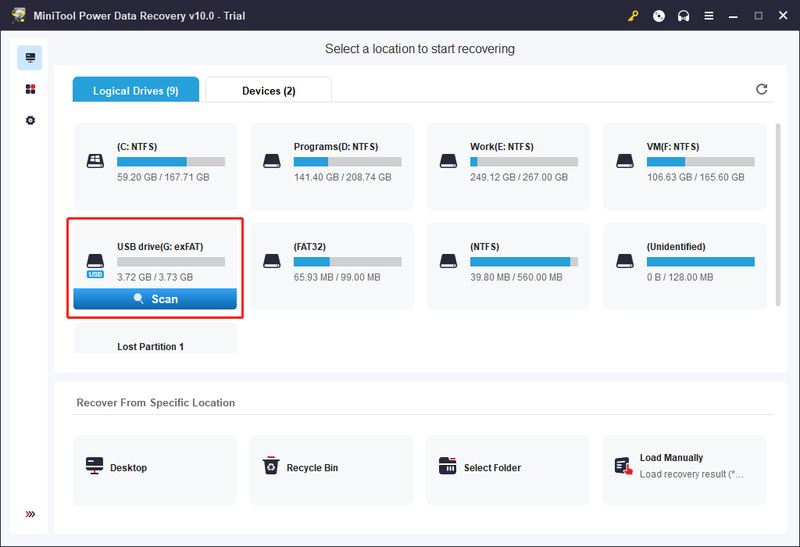 MiniTool Power Data Recovery is a dedicated file recovery tool which can be used to recover files from various types of data storage devices, like computer hard drives, SD cards, memory cards, USB flash drives, and more. It has four recovery modules. 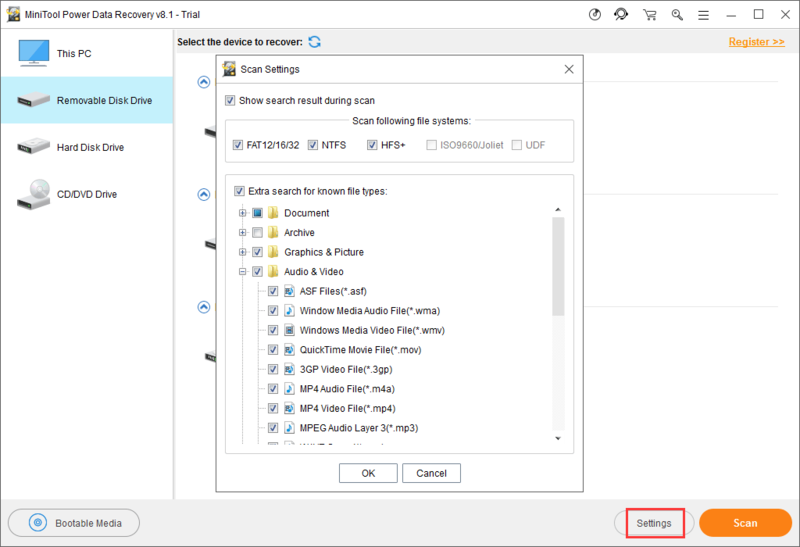 If you want to recover data from a general USB device, you need to use Removable Disk Drive module; if you want to restore files from the external hard drive, you have to choose This PC mode. Take the general USB drive as an example. Step 1: Connect the USB drive to the computer which has installed the data recovery software. Then, open the software and you will see This PC interface directly. Then, choose Removable Disk Drive from the left list. The target USB drive will be shown on the interface. If not, press the Refresh button to have a try. Here, you want to recover some certain types of files, you can use the Settings feature to make some selections. Step 2: After a while, the scanning process will end and you will see the scan result interface. Step 3: Since you are using the Trial Edition of this software, you are not allowed to recover your needed files finally. Don’t worry. If you discover this software can find the files you want to recover, you can update it to a full edition to recover data without limitation. If you are a personal user, the Pro Deluxe Edition can fully satisfy your requirements. Moreover, if the target USB device is an external hard drive, you need to use This PC module of this software to recover its data. The data recovery steps of this module are as simple as Removable Disk Drive.